Last Name - Report the last name of the primary consumer. Titles and prefixes should not be reported. If the surname contains multiple last names, hyphenate the two surnames. For example, Smith-Jones requires the hyphen. If the surname contains two separate words, the hyphen is not required. For example, report Van Dyke with a space between the two words. If reporting Hispanic names, hyphenate the two surnames: Paternal Name - Maternal Name. Do not report trustee or estate accounts. First Name - Report the first name of the primary consumer. If reporting multiple first names, hyphenate the two first names. Middle Name - Report the middle name or middle initial of the primary consumer, if available. If reporting multiple middle names, hyphenate the two middle names. Social Sec# - Report the Social Security Number of the primary consumer. Report only valid SSNs. If not available leave blank. Note: Do not report Tax Identification Numbers in the field. Date of Birth - Contains the date of birth of the primary consumer. Reporting of this information is highly recommended as the date of birth greatly enhances accuracy in matching to the correct consumer. If the month and day are not available, use 0101 with the four digit year. The four-digit year is required. If no date is available leave blank. Note: Do not report accounts of consumers who are too young to enter into a binding contract. 5 = Co-maker or Guarantor (this consumer is the co-maker or guarantor for this account, who becomes liable if the maker defaults. Z = Delete Borrower. Note: Only inaccurately reported consumers should be deleted. Note: Codes 0 (undesignated), 4 (joint) and 6 (On-Behalf-Of) are obsolete as of September 2003 and may no longer be reported. Consumer Information Indicator - Contains a value that indicates a special condition of the account that applies to the primary customer. This special condition may be that a bankruptcy was filed, discharged, dismissed or withdrawn; a debt was reaffirmed; or the consumer cannot be located or is not located. The indicator should be reported one time and will be deleted only when the appropriate removal code (Q, S, U) is reported. A = Name, Address and /or Social Security Number change If account or borrower is not new, or if no change in consumer information do not report a value. Country - Contains the standard two-character country abbreviation. See the Reference section on Country Codes for a list of code. Address Line 1- Contains mailing address for the primary consumer and usually includes street number, direction, street name, and type of thoroughfare. If the mailing address is a PO Box or Rural Route, include Box or Route followed by the number (e.g., PO Box 100). Do not report both a street address and a PO Box. Eliminate internal messages such as: "Do not mail," "Attorney," " Charge-off," "Chapter 13," "Fraud," etc.. For further information see the Reference section on General Rules for Address. Address Line 2 - Contains second line of address, if needed, such as apartment or unit number, or private mailbox number (PMB). Eliminate internal messages such as: “Do not mail”, “Attorney”, “Charge-off”, “Chapter 13”, “Fraud”, “Trustee”, or “Estate of”, etc. City - Report the city name for address of primary consumer. Truncate rightmost positions if city name is greater than 20 characters or use standard 13-character U.S. Postal Service city abbreviations. State - Contains the standard US Postal Service state abbreviation for the address of the primary consumers. See the Reference section on State Codes for a list of cods. Zip Code - Report the Zip Code of the primary consumer's address. 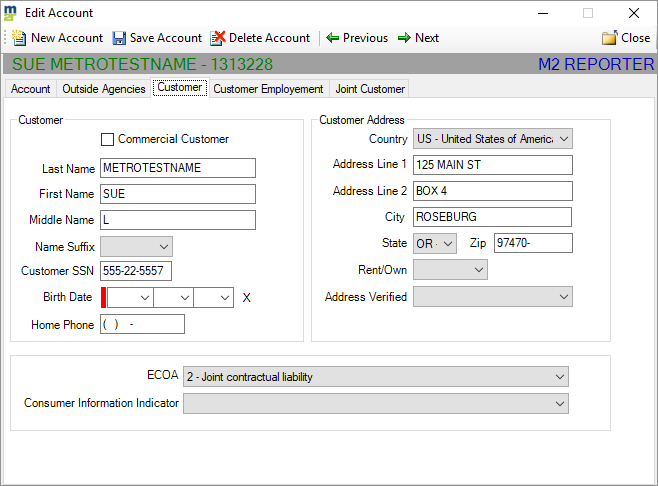 Address Verified - Use to further define address information. Do not use if there are no codes that apply.